When your friends come home from Ibiza, you almost always only hear about their party stories: the clubs they went to, the DJs they saw, and how expensive drinks were. Despite being a curious and attentive listener to many Ibiza vacation stories, here were 15 details that still came as a surprise to me on my first visit to the wonderful Balaeric Island of Ibiza. I knew that Ibiza is properly pronounced the Spanish way as I-bith-a, but what I didn’t know was there was yet another name for the Island. Ibiza is the Spanish name for the city, but Eivissa is the Catalan name. Expect to see signs that say Eivissa, and know that it’s the same as Ibiza. I expected a densely populated, easily walk-able club district in Ibiza, but on the contrary, it seemed like the major clubs are spread throughout the island, many kilometers apart from each other. Even with no traffic, it can take 20+ minutes to cab to where you need to be. When your friends come home from Ibiza, you almost always only hear about their party stories: the clubs they went to and the DJs they saw. However, Ibiza is way more than just a clubber’s paradise – the beautiful Mediterranean beaches are also a popular vacation destination for European families. Another family-friendly island destination, that you likely have to go through Ibiza to get to, is the neighboring island of Formentera, which is just a 45 minute ferry ride away. Prior to being the party destination it is known for today, Ibiza also has a rich history. XYZ. 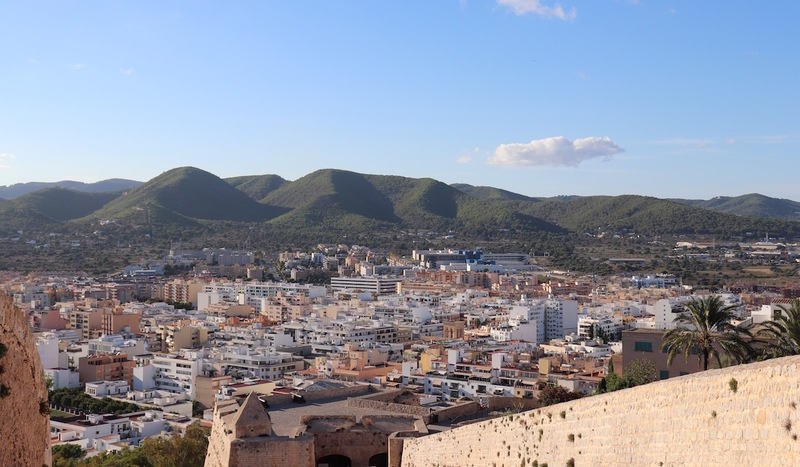 To see a piece of history for yourself, take a walk up to Ibiza Castle in the old town, where you can see a series of old cannons that guard the city. The “University of the Balearic Islands” is located in Ibiza. We passed by it on our way up to Ibiza Castle. 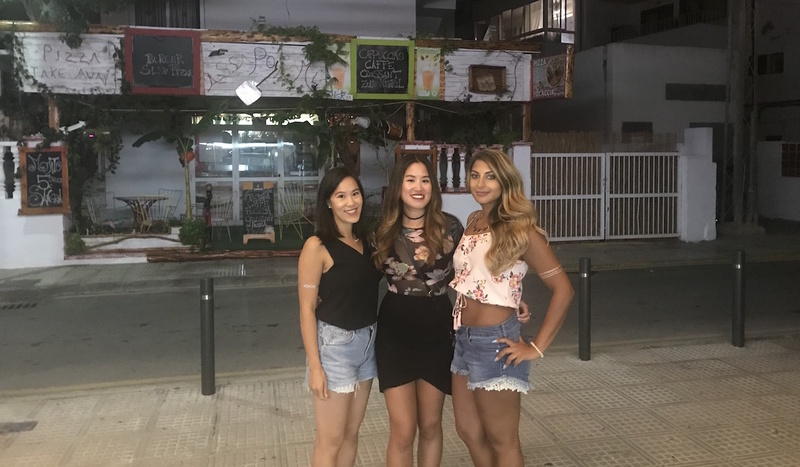 I have no clue how any student could possibly concentrate on their studies on an island with as much nightlife as on Ibiza! 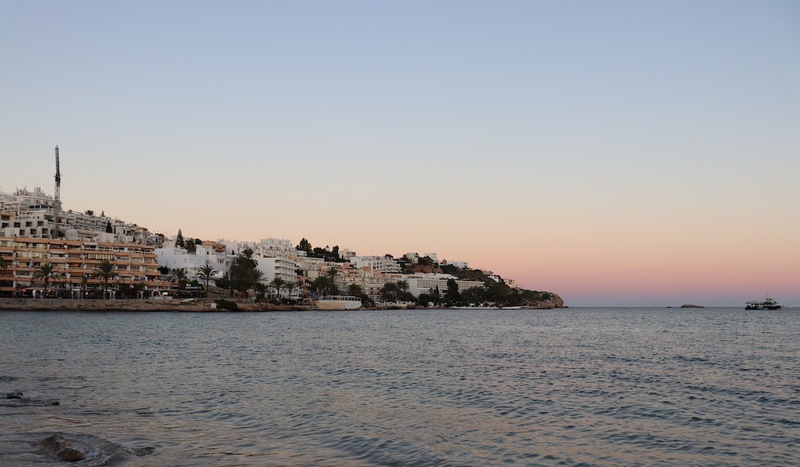 The West-facing San Antonio strip is known as the best sunset watching spot in Ibiza. If you want front row seats for the sunset view at Cafe Mambo or Cafe Del Mar, the minimum charge (we were told) is €65 per person on food and/or drink. However, we lucked out and scored a rarely-available table closer to the back of the patio, which had no minimum spend, and the view was just fine (minus a few heads in the way of the sunset). We purchased our tickets online from Ibiza Spotlight three months before our trip. On both of our club nights, we arrived ‪between 1 and 2am, and there was hardly a lineup because partygoers were being moved so efficiently through the queue. On our way home, there were also designated lineups for catching a cab. Like a well-oiled machine, the cabs swooped into the club driveway, efficiently picked up the groups in line, and sped off. Other than checking our tickets, no one checked our ID’s, bags, or did a full body pat-down. It definitely depends on the night and the club, but at Amnesia, cutoff denim shorts and sneakers were totally acceptable as an outfit. The next night at Pacha for ‪David Guetta’s closing party people were a bit more dressed up, but the overall dress code is way less pretentious than a night out in North America. Unlike Las Vegas, where men often have to pay more to enter a club, there’s no silly premium for men. Regardless of your gender, your admission is the same. If you’re taking a night off from drinking to save money, you probably won’t save too much. A bottle of water is €9 for a small bottle, whereas a beer at €12 is not much more in comparison. 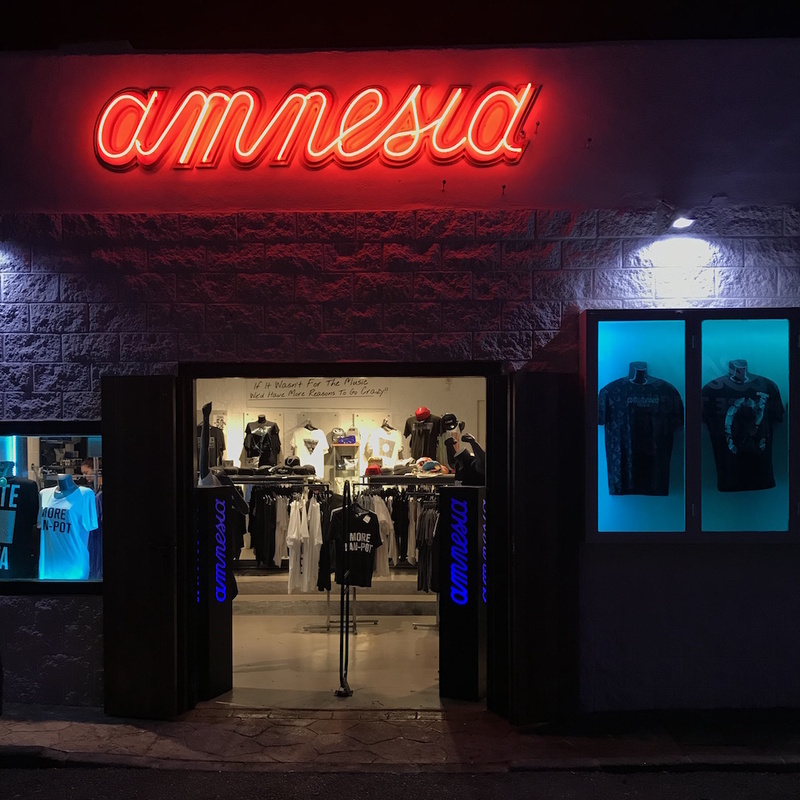 Clubs in Ibiza are so iconic that many of the major clubs have their own gift shops where you can buy branded swag. To give you an idea of prices, a Pacha tanktop is about €29, while a hoodie is around €60. If you miss out on purchasing at the club, there are club-themed stores around the city, or, as a last resort, at Ibiza airport. Given how it can be quite pricy to eat out, the grocery store is surprisingly affordable. A loaf of bread, cheese, or a 6-pack of eggs is only one Euro each. If you’re staying in a room with a kitchenette (like we did), a simple breakfast of toast with eggs or avocado, a banana and/or yogurt, can easily kickstart your day and save on eating out for breakfast. Ibiza’s economy is heavily dependent on tourism, which peaks in the summer. When we visited Ibiza in October, it was the very tail-end of the club season. From October onwards, restaurants, clubs and pools start shutting down. In fact, we went to a restaurant that no longer served their full menu, because they were preparing to close for the rest of the season. If you miss out on Ibiza this year, clubs begin to open again in mid-April of next year. In a last minute scramble before heading to the airport, I bought a slice of pizza from the eatery across the street from our hotel. But when we arrived at Ibiza Airport, there were a surprising number of cool little eateries. In fact, they have a food market called strEAT serving everything from Italian, to Spanish Tapas, to Sushi. If I didn’t have my slice of pizza before, I definitely would have liked to try something from Ibiza Airport. ← Is the €65 Minimum Spend Worth the Sunset View at Café Mambo in Ibiza? We went in (late) September also — seems like it’s better than going during peak season because the town is less busy and everything is more affordable.